Join us at the Austin, TX Startup Crawl on October 9, 2013 and download our DDG made iPhone App! Learn more about this year's Startup Crawl. DDG is an iPad and iPhone programming company. We provide consultations and design for your applications. Our specialization is social networking applications. 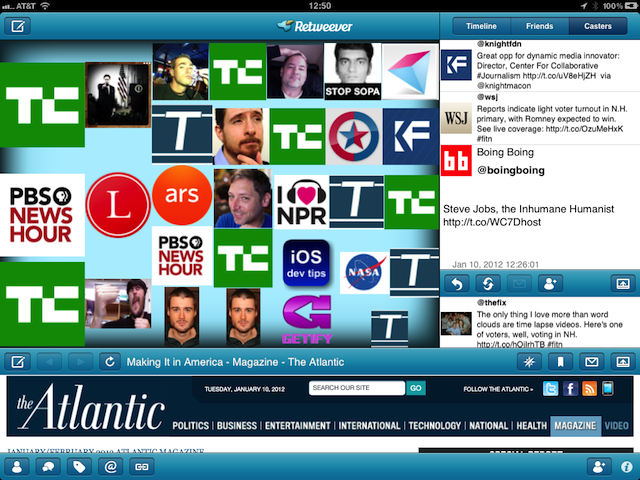 Visually dynamic and highly interactive, Retweever® streamlines your twitter viewing. Log on and Retweever categorizes your tweet-stream as it downloads, so you see what’s important to you first. Retweever uses the iPad screen as a palette to present twitter messages in avatar icons. The icons scale with their relevance and timeliness to the ongoing twitter conversation. It’s eye-catching. It’s informative. It’s useful. Learn more at our website or download for free directly from the App Store. What is iPad or iPhone consulting? Why is DDG the right company for me? What will I get out of iPhone consulting? iPad and iPhone consulting can mean whatever you, the customer, want it to mean. However, the company was built to contract and design iPhone programs for consumers. In other words, you bring an idea of a program you would like to see made and we make it for you. At DDG, we will work with you to get exactly the program you want. If you need ideas, we can bring them to the table. If you know exactly what you want, we’ll make it. Although this is a new company, Andrew, our iPhone programmer, has years of experience programming and networking in the computer industry. First and foremost, you will get a functioning iPhone program built to your specifications. You will get a sleek, modern design. You will get a foot in the door in an important emerging industry.